The greatest Star Trek movie of all time has got to be “The Wrath of Khan,” it is not only the most famous Star Trek film, it is one of the definitive films of the genre, with one of the most singular villains in all of film. Khan is a bad dude who, on his own, brings the brass of the Enterprise to their knees.It is not a coincidence that the most recent installment, “Into Darkness,” reached to Ricardo Montalban for inspiration, they know that to raise the stakes, they needed a villain who could threaten Kirk and Spock with something more interesting than an armada, something more Machiavellian than mere mass murder. That being said, maybe the 2009 reboot is actually the best Star Trek we’ve yet seen. 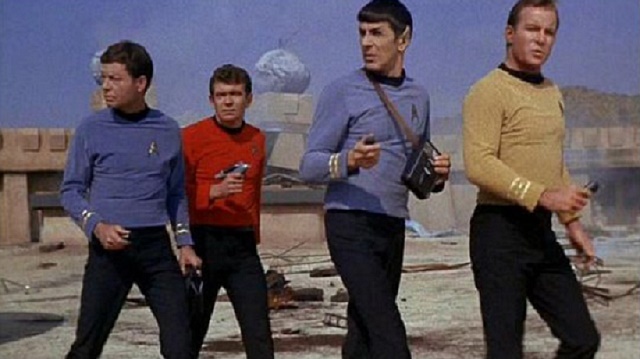 Star Trek has seen film after film, and series after series, grab the hearts of sci-fi fans, but never has the Enterprise grabbed the public zeitgeist by the groin the way the Millennium Falcon and lightsabers have for almost forty straight years. The original series only lasted three seasons and, though later itinerations and the films have been ever present, it has never been on the same blockbuster level. It’s possible that the focus on statesmanship and intergalactic politics, while casting aside the high adrenaline dog fights and duels, was not only Star Trek’s most unique characteristic, but also its greatest weakness. When J. J. Abrams took the helm of the property he made it clear his plan was to bring some Star Wars to Star Trek, and it has worked with two unequivocal blockbusters. Even though some would debate the success of “Into Darkness,” it still pulled in just under $500 million worldwide, a pretty decent haul for any movie not derived from James Cameron, DC or Marvel. It’s hard to argue against the success of fast paced action, hard hitting heroes and diabolical villains with global, or galactic, destruction on the brain. Then again, perhaps the answer is less obvious than the first and also less cynical than the latter. The Transformers films may be blockbuster but it is difficult to find fans of the filmmaking. Ratcheted up excitement and seizure inducing effects can rarely replicate the lasting success of truly brilliant story telling. The final appearance of the original cast on screen together was also their finest hour. With a story paralleling the end of the cold war, political turmoil abounds as the Klingons sue for peace and the Federation acquiesces before saboteurs almost cause both sides plans for peace to collapse. Kirk and Spock must do what they do best, find a way to save two civilizations in the face of dangers far more complicated that a mad man hell bent on evil. This entry was posted in Editorial, Film Review, Nerd Out and tagged Cinema, Movies, Sci-fi, Science Fiction, Star Trek, Star Wars.